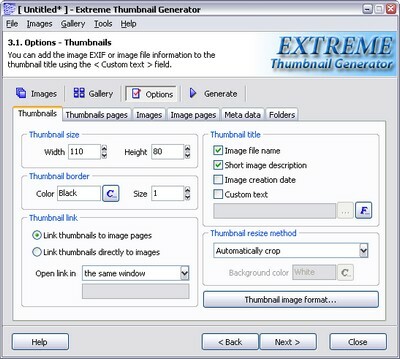 Extreme Thumbnail Generator offers you several ways (methods) of resizing the original image to create a thumbnail. You can choose resize method on the Options step, the Thumbnails tab. Note: in the examples below the "wide image" is the image with width grater than height, and the "tall image" is the image with height greater than width. The original image is reduced in size to fit either selected thumbnail width or height. For wide images the thumbnail width will be reduced to fit and for tall images - height. The other side of the image is reduced in size using the same ratio, so the thumbnails for wide and tall images will have different size. First, the original image is reduced in size to fit the selected thumbnail width or height. For wide images the image is reduced to fit height, for tall images - to fit width. Then the side that doesn't fit the selected width or height is cropped to finally fit it. The size of the resulting thumbnails will always be exactly as specified in the thumbnail width and height. The original image is reduced in size to fit the selected thumbnail width. Then the image is cropped to fit the selected thumbnail height. The original image is reduced in size to fit the selected thumbnail height. Then the image is cropped to fit the selected thumbnail width. The original image is reduced in size to fit the selected thumbnail width and height. The resize ratio for width and height can be different, so the original image proportions can be lost in the resulting thumbnail. The original image is reduced in size using the Scale resize method. Then the resized image is drawn on the rectangle with width and height exactly as specified in the thumbnail size settings and user-selected background color.